Home > Jewelry Cleaning, Jewelry Care > Jewelry Cleaning Machine, Jewelry Spa. The Best Gift, for the Jewelry Lover in your life! JW10, BRAND NEW, Professional Jewelers and Home Jewelry Cleaning System. This system is used by many professional jewelry shops and jewelery stores as well as people in their own homes. Use it to clean jewelry such as gemstones, and precious metals. Non vibrating, will NOT loosen settings. Make your jewelry sparkle with this professional quality jewelry cleaning system. This Jewelry Spa was developed for, and used by professional jewelers worldwide. 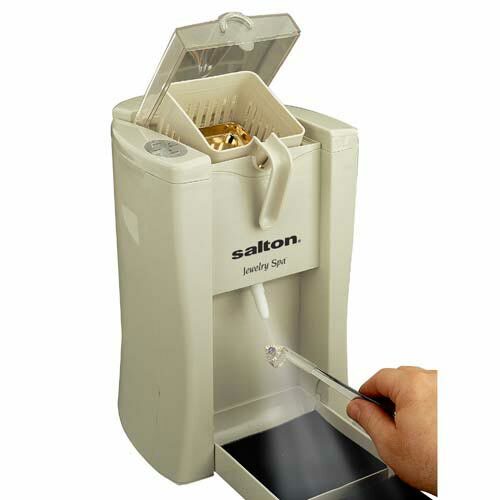 Now you can clean your precious jewelry just like the professionals do, in the privacy of your own home with your new Salton Jewlery Spa jewelry cleaning system. In just 4 easy steps, you can have your jewlery looking brand new in just minutes. A heated bath using a specially formulated jewelry cleaning powder to remove dirt, grime and also micro organisms which cause skin rashes. Effervescent 60 second Electro Chemical jewelry cleaning cycle using Salton's gentle patented 6V DC current, eliminating the need to use vibrating methods used by other jewelry cleaners that can actually loosen your settings! This machine does not use ultrasonic waves to loosen dirt and clean jewelry. It uses low voltage negatively charged ionic molecules to loosten the dirt. Pressurized moist steam cleaning rinse blasts away dirt in the hardest to reach places, leaving your gemstones and metals sparkling clean. The NEW ionic jewelry cleaner Jewelry Spa Kit by Salton, contains everything you need to start getting professional results in the safety of your own home. Just add distilled water to the ionic jewelry cleaner, and you are ready to start cleaning your jewelry. This new home remedy jewelry cleaner is the solution for many people searching for the best jewelry cleaner. You will see that our home remedy jewelry cleaner will make your jewelry sparkle with brightness, as all of the dirt is ionized and then steamed away. This jewelry cleaning system is considered by many, to be the best jewelry cleaner on the market today. Try our new jewelry cleaning machine, and make your jewelry shine again. Here at AAWSALES everything is always on sale, and we have somethng for everyone! Hi, Thank you aawsales, for making this heavy duty jewelry cleaning machine available to the general public!